This soap is amazing. AMAZING! I had used oragnic and natural products on my skin for about a year and my silly behind, in an effort to be thrifty, bought a cleanser from Target to see if I was just imagining the results from natural products. I woke up with the crapppiest skin I'd ever seen on my face! I could fry an egg on my cheek it was so oily and I developed little bumps on my forehead and jawline. I was mortified because my efforts had gone to waste the second I went back to chemically loaded prodcuts from HELL. Well, I'd considered your Dead Sea Warehouse Original Face & Body Bar for quite some time but the price was the only thing making me keep walking past the aisle. I'm on a strict budget. I finally gave in last Friday after seeing an overload of glowing, healthy sun-kissed skin on a warm day and then looking in the mirror. Annie, in ONE use my skin improved! ONE. This is my third day using it and the bumps are gone and I'm glowing like I'm pregnant! I cannot thank you enough! I have recommended this soap to EVERYONE I know and bought one for my grandmother who has very dry skin. If I hear of ANYONE having a skin problem of any kind I will be sure to mention your fabulous soap. Marcella Glowing Skin Licea, Sonoma, Ca. 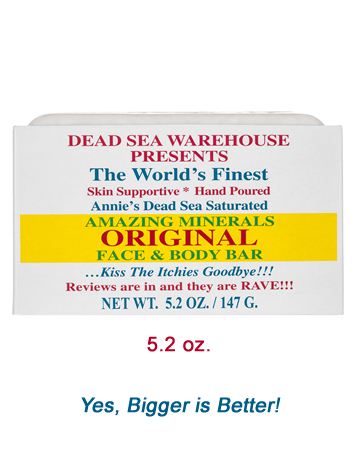 Experience my WILDLY POPULAR skin-soothing Dead Sea Warehouse Original Face & Body Bar just like our original 4 oz. pour Dead Sea Original Face & Body Bar**. Olive Oil, Palm Oil, Coconut Oil and loads of Dead Sea Minerals.....NO SCENT, NO COLORANTS...slowly and lovingly hand measured, stirred, poured, trimmed and packaged here in the U.S.A. Nothing prepared me for the market place excitement this simple, effective soap has created. Customers tell me they carry it with them at all times, even hide their soap from others. DISCOVER WHY....And Feel the Differences Immediately! *Hand measured, hand mixed, hand poured, hand trimmed, hand packaged here in the U.S. by well paid soap makers! Ingredients (INCI): Saponified Oils of Olives, Palm and Coconut, Dead Sea Minerals. Please Note: Dead Sea Warehouse is committed to non-gmo oils in their soap making. (Click Here for More Information).